14ymedio, Pedro Campos, Miami, 18 May 2017 — In an effort to persuade Cubans and the international left that “Cuba is building socialism,” while seeking to convince the world that Castroism is abandoning State Totalitarianism and also trying to counteract the relative independence achieved by the so-called boteros, or boatmen, as independent taxi drivers are known, the state’s effort to “update the economic model” includes the introduction of what they are calling Taxi Rutero, offering rides at 5 Cuban pesos per trip. They are not cooperatives, in their strict sense, because they do not arise from the spontaneous idea of ​​workers pooling their capital and resources to organize production collectively and distribute profits. Rather, they are state-owned leasing companies, called cooperatives, that hire vehicles to the drivers who are given some advantages, such as low gasoline or oil prices, and who are paid daily but must hand over everything they collect. More or less what they have been doing with the urban buses in the capital lately. Now, the state is confronting its inability to deal with the boteros who, faced with inflation generated by bureaucratic policies and their problems getting fuel, decided to raise prices and launched a kind of strike when the state imposed a price cap. So, instead of negotiating with them and finding solutions that solve the problem for the good of everyone, the state decides to invent “taxi cooperatives” which are nothing more than a version of the bus cooperatives, featuring cars. 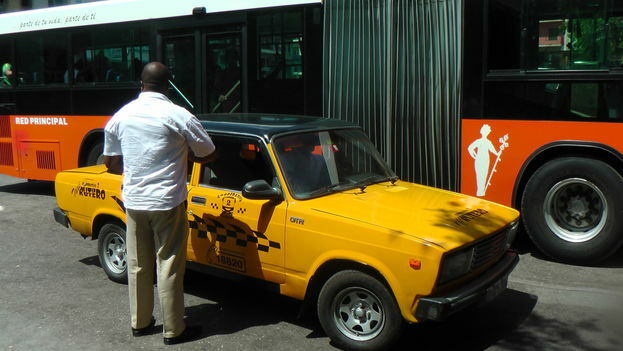 The cutting edge of the new “cooperatives” is clearly directed against the boteros, setting a price of 15 pesos for a ride that the private drivers charge 20 to 25 Cuban pesos for. This is not a solution to the transportation problem, this is an attempt to crush the boteros, because Cuba’s intolerant state system does not know how to and has no interest in negotiating with people, with the workers, it only knows how to impose. Something similar has been done with service “cooperatives,” such as cafes, shoe repairers, household appliance repairers and others, in old unsustainable state entities. In practice, they have leased the premises and equipment, without ever being offered the property and with the subsequent activities subjected to countless state controls. It’s a lie. There is nothing “cooperative” about it. It has already become common for the Castro’s Stalinist and antisocialist state to label their para-state inventions cooperatives. These misrepresentations come from the early years. Then, under the personal leadership of Fidel Castro, the sugar cane cooperatives were created, without giving them the land. The system of sugarcane cooperatives showed signs of increasing independence, controlling their own finances, creating the village shops, and forcing the Sugar Industry Ministry to pay for the cane they cut, plus they had their own militias and bought the machinery they needed with their own money. When Carlos Rafael Rodríguez was appointed president of National Institute for Agrarian Reform (INRA) in February 1962, he dissolved the sugarcane cooperatives in the middle of that year’s harvest, to create “farms for the people,” and thus to convert those in the cooperatives into wage laborers. He handed over their lands to Che’s Sugar Ministry (MINAZ), and thereby destroyed the monetary-mercantile relationship between agriculture and the sugar industry. Later, when it became clear that the agricultural farms were not working with wage labor, they invented the Basic Units of Cooperative Production, UBPC, cooperatives in name only because the workers continued to receive salaries from the State. These salaries were linked only to meeting the “Productive Plans,” not to the actual market results, and the plans were developed by the state with the requirement that they deliver the production the plans “committed” them to, to a collection system where the prices were set by the buyer (i.e. the state). A complete farce. Sometimes we give the socialists the benefit of the doubt. Has this arbitrary management of the concept of cooperativism led us to the point where its manipulators have no idea what a cooperative is? Do they do it to try to fool the uneducated politicians who abound everywhere? Or is it part of a plan to discredit the original socialist idea of ​​Karl Marx’s self-managing cooperativism?